​Ernesto Valverde has revealed that Lionel Messi faces a late fitness test ahead of Barcelona’s La Liga clash with Athletic Bilbao on Sunday. The champions travel to the Basque Country looking to extend their lead at the top of the table, with Real Madrid having closed to within five points of the Catalans after beating fellow title rivals Atletico Madrid on Saturday. ​Barca have drawn each of their last two outings and will look to get back to winning ways on Sunday, though they may have to make do without their talisman due to a recent thigh injury. 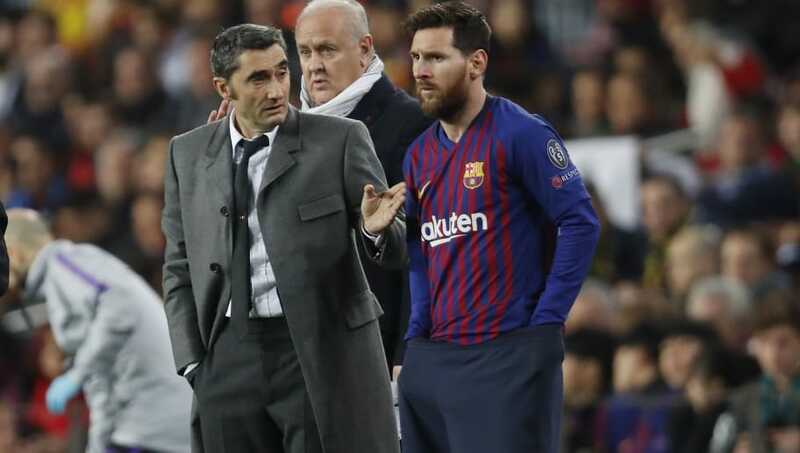 As quoted by the ​Evening Standard, Valverde said of ​Messi: “As always, we have to wait to make a decision. “The other day [Wednesday’s Copa del Rey match] we did not want to risk him and we are in a similar situation tomorrow. Lionel Messi has failed to score or assist in just *four* of his games this season. Messi was named among the substitutes as Barcelona were held to a 1-1 draw with ​Real Madrid in the first leg of their Copa del Rey semi-final tie on Wednesday, though the Argentine was brought on as a second half substitute. Fellow forward ​Ousmane Dembele is also in line to return to the fold for Sunday’s trip to Bilbao, having missed out through injury in recent matches. However, the champions will be without key midfielder Arthur, after the Brazilian sustained a hamstring injury which is set to keep him out of action until next month. Barca’s defensive issues have also suffered a blow, with Jordi Alba suspended for Sunday’s game, leaving the Blaugrana without a recognised left back.